If you own a home or business, you’d probably sign up in a heartbeat for a house or office that’s consistently warm and toasty in the winter as well as cool and comfy in the summer. Those structures would be even more attractive if the heating and cooling system is out of sight, performs efficiently and doesn’t need expensive maintenance or technical knowledge for operation and repairs. Sounds nice, right? Well, it’s all possible thanks to the availability of 21st century geothermal heating and cooling systems. As a leading commercial and residential HVAC company, Tuckey Mechanical Services provide high efficiency, environmentally-friendly geothermal HVAC (heating, ventilating and air conditioning) systems that draw on the earth’s organic underground temperatures, delivering heating in the winter and cooling in the summer. Geothermal energy is as old as the earth itself. More than 60,000 geothermal heat pumps per year are added in the United States. Geothermal heat pumps save on fossil fuels—40 trillion BTUs every year. 1.6 million metric tons of carbon are eliminated annually through the use of heat pumps. Heat pumps reduce electricity consumption by 2.6 million kW. Geothermal systems reduce heating bills by 70 percent and cooling bills by 40 percent. The geothermal cost-per-BTU is much lower than other heating methods. The resource base for geothermal energy is larger than those for coal, oil, gas and uranium combined. 10,000 years ago in North America, areas around hot springs were neutral zones where warriors of Paleo-Indian tribes could bathe together in peace. Since ancient times, geothermal energy has been used for bathing, heating and food preparation. Modern geothermal HVAC systems are not quite that old, but they’re not new technology, either — they’ve been in use in the United States and around the world for more than 60 years. The allure is three-fold: Geothermal systems are nature-friendly, spout no greenhouse gases, and are less costly over time than traditional systems. In recent years, geothermal HVAC systems have moved front and center as desirable features in eco-friendly structures, and that’s significant given that green projects represent about 20 percent of new homes built alone in the U.S in 2012. Then, by 2016, it’s estimated the green housing market will grow by $78 billion per year to almost 30 to 40 percent of the housing market in the U.S. While outdoor temperatures fluctuate with the seasons, underground temperatures remain almost constant year-round due to the earth’s insulating properties. A Tuckey geothermal system generally consists of an indoor handling unit and a network of pipes buried about four to six feet underground, called an earth loop. The geothermal system taps into the constant temperatures to deliver so-called “free” energy to heat or cool the house or building. Earth loop pipes are buried underground and are connected to a well that’s drilled into the underground water. In the winter, water circulating through the system absorbs stored heat in the ground and carries it through the pipes to the indoors. The indoor heat exchanger converts the heat to a higher temperature and circulates it throughout the building. In summer, the geothermal HVAC system draws heat from the building and sends it through the earth loop to a reinjection well. The heat travels through a cooler aquifer and is then recirculated back into the building as cooler air. A geothermal system is comprised of three main components: a heat pump, a liquid heat exchanger and an air-delivery system consisting of ductwork and/or a radiant heating medium, such as fiberglass mesh. Geothermal heat pump efficiencies are determined based on their coefficient of performance (COP), which is a scientific way of calculating how much energy the systems move versus how much is consumed. Geothermal heat pump systems typically have COPs of 3.0 to 5.0, which is the equivalent of one unit of energy used in return for three to five units of supplied heat — an excellent ratio. Cost savings: They might cost more in the short term, but geothermal system efficiency could result in average savings of 80 percent over fossil fuel in the long term. Since fuel is not necessary, the costs associated with purchasing, transportation, and clean up are quite low. Less reliance on fossil fuels: Geothermal systems don’t burn fossil fuel to generate heat. Instead, they transfer heat to and from the earth. 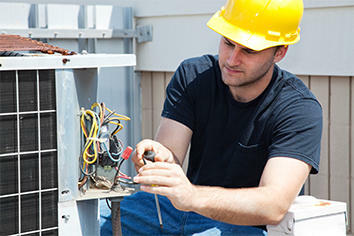 Generally, electric power is used only to operate a system’s fan, compressor, and pump. In short, geothermal energy is very environmentally friendly. No pollution: This is one of the main advantages of using geothermal energy — it doesn’t create pollution. Geothermal is a renewable source of energy and, therefore, helps reduce global warming and pollution. In addition, geothermal systems don’t create pollution since the gases they release from deep below the earth’s surface are relatively harmless to the environment. Free hot water generation: Geothermal systems can produce hot water for a home or business at much higher efficiencies than other methods. In a house, a geothermal system can send hot water directly to the water heater. An added benefit is that throughout the cooling cycle, the heat removed from the home is deposited to the water heater instead of the ground, providing the home or business owners with virtually free hot water. Improved comfort: Nothing beats a geothermal system for even heating and cooling, eliminating hot and cold blasts of air associated with traditional systems. Geothermal systems also dehumidify the air during hot summer, muggy months. Quiet: Geothermal systems operate as quietly as a refrigerator or freezer, and they eliminate the need for noisy outdoor units that might disturb the neighbors. Businesses that install qualified geothermal systems are eligible for investment tax credits of 10% of the installed cost, available through the end of this year. Another option is a grant worth 10% of the installed costs for equipment installed in the period of 2009 and 2010. In situations where geothermal power produces electricity, installed equipment is qualified to receive incentives up to but not including the transmission of the electricity. Qualified systems include ground source heat pumps and related equipment to produce, distribute, or use thermal-derived energy. Businesses can also take tax deductions for new or renovated buildings if they reduce energy costs associated with lighting systems, building envelopes, and heating, cooling, and water-heating equipment. To be eligible, buildings need to comply with the ASHRAE 90.1-2001 standard and must have been in service between January 1, 2006 and December 31, 2013. Deductions of $1.80 per square foot per building are available for buildings that save 50 percent or more of the projected annual energy costs. 10 percent of the projected annual costs on energy. 20 percent of projected lighting costs. 20 percent of projected heating & cooling costs. Buildings must receive certification from a qualified engineer or contractor that it has met the required savings goal. The efficiency of geothermal systems make them superior choices over traditional air source heat pump systems, if installed properly. However, like any home heat and cooling comfort system, geothermal systems have their own set of pros and cons. For example, geothermal systems are generally too costly to install at homes with traditional system and ductwork already in place. Another example is homes on very small plots — they simply may not have enough space to generate the thermal energy required to heat and/or cool the house. Tuckey Mechanical Services can help homeowners make the best decision for their property. How Do Geothermal HVAC Systems for the Home Work? The two types of geothermal systems generally used for residential installations are open loop and closed loop. An open loop system draws water from the well and discharges the water back into the same well, into a second well, or into a French-type drain back into the ground. A closed loop system circulates the water through horizontal or vertical piping buried in the ground. Although geothermal systems can be installed in most homes, they do require enough space to install the loop system. If a geothermal system is a possibility, homeowners should be sure to check for drilling or excavating code compliance with their local authorities. Like any system, when considering the installation of a geothermal system, a heat loss/gain calculation on the home is essential prior to selecting any equipment. Tuckey Mechanical Services experts are always available to help homeowners with this important procedure. Unlike traditional air source pumps, geothermal systems exhibit good dehumidification properties and can be can be precisely sized in accordance with the actual heat loss of the home. However, the best application for geothermal systems is new construction, where the equipment and the duct system can be sized simultaneously and not as a retrofit. Cost wise, geothermal systems are about two three times more in up-front costs than air source heat pumps. Although geothermal systems are more efficient and do not require as much maintenance, the purchase and installation costs might be prohibitive in terms of an acceptable payback period. That depends on considerations such as the age of the home, insulation and infiltration conditions, temperature settings, weather conditions, and whether the home is equipped with an existing duct system. Tuckey Mechanical Services professionals can help homeowners make the right decision. The good news is that if geothermal is not an option, significant improvements in air source heat pump technology in recent years may result in better energy and cost savings. Recent vintage, variable speed-type traditional equipment can help homeowners achieve efficiencies approaching that of geothermal heat pumps. Myth: Geothermal HVAC systems can’t be considered renewable because they use electrical energy. That’s true, but they only use a single unit of electricity to transport up to five units of cooling or heating. Myth: Options such as photovoltaic and wind power are better than geothermal HVAC systems. According to Jay Egg’s article on geothermal heating and cooling, “Geothermal HVAC systems remove four times more kilowatt-hours of consumption from the electrical grid per dollar spent than photovoltaic and wind power add to the electrical grid.” There is no single best green solution for every situation, but geothermal HVAC often has a leg up in cost-effectiveness when it comes to reducing the impact of heating and cooling on the environment. Myth: Geothermal HVAC requires lots of land to accommodate the polyethylene piping earth loops. It depends. The earth loop could be buried vertically, which means the amount of surface required above ground may not amount to much. Additionally, if there’s an aquifer available, only a few square feet of land are necessary. It’s important to remember that the water is not impacted because it circulates back to the aquifer after it passes through a heat exchanger. Myth: Geothermal HVAC systems are noisy. Geothermal systems are very quiet because there is no outdoor equipment to irritate the neighbors. It’s important to know that geothermal systems are often not the most appealing for existing homes because it may be too costly to retrofit geothermal components if the homes are already equipped with traditional systems and ductwork. Geothermal systems may still cost more up front than traditional systems as well, but they often provide improved efficiency and lower operating costs over time—as much as 80 percent on average—making them an attractive option for many home and business owners. Contact us for more information about Tuckey geothermal HVAC systems and other Tuckey products and services.